Triangle Fraternity is a popular social fraternity. Its members are male students, who study architecture, biological, computer, mathematical and physical sciences. Triangle Fraternity is the member of North-American Inter-fraternity Conference. The fraternity was founded in 1906. Later, the fraternity was incorporated by the state of Illinois. Now, Triangle Fraternity has 33 chapters and 4 colonies on the territory of the United States. Triangle Fraternity has headquarters in Plainfield, Indiana. 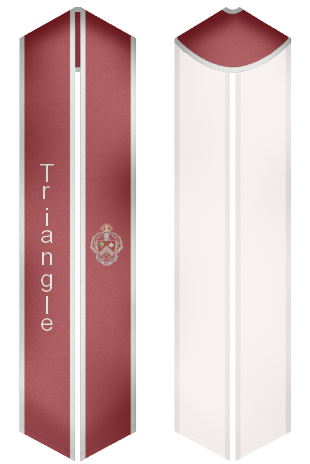 Are you a member of Triangle Fraternity, who is going to leave your college soon? Here, you will find great sashes for Triangle Fraternity that will make your graduation day the most unforgettable event in your life.